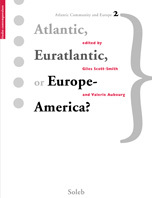 éditions Soleb — Atlantic, Euratlantic or Europe-America? Atlantic, Euratlantic or Europe-America? 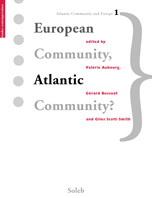 What did the Atlantic Community mean for the nations of North America and Western Europe during the 1960s and early 1970s? This book, spanning the period from presidents Kennedy to Nixon, offers a wide-ranging set of views on this topic. National perspectives from the main protagonists—the United States, Britain, France, and West Germany— are complemented by studies on the role of non-state institutions and public diplomacy in maintaining close transatlantic relations. The book moves from the high optimism of the Kennedy years, with the attempt to reframe transatlantic relations around two more equal poles in the United States and a uniting Europe, to the series of disagreements and disputes that energised transatlantic diplomacy during the Nixon years. In doing so, the book provides a unique overview of the main trends and troubles of the transatlantic relationship during a critical period, and shows how various channels—both diplomatic and non-diplomatic—were used to overcome them and maintain a strong alliance. Collection « Études contemporaines ». Version imprimée : 45 euros, format 176 x 230 mm, 588 pages. Isbn 978-2-918157-00-7 (english). Version numérique : 14,99 euros, Isbn 978-2-918157-15-1. Vous pouvez commander cet ouvrage chez votre libraire, ou acheter la version numérique (Pdf, ePub, Kindle).